The Refined Trainings Local Single Sign On (SSO) feature enables users to access the Refined Training platform (LMS) from their company’s secure server, or a front end management system with one single sign on (log in) access. One or more web sites in an organization’s online infrastructure can be linked directly to the company’s training site. Users no longer need to sign in multiple times to access the training site (LMS). Single Sign On is available for Refined Data hosted sites, enabling users to be linked directly from their operational system (intranet domain) to Moodle through the creation of a post request. This feature simplifies life for the end users and creates an ease of transition between internal sites. 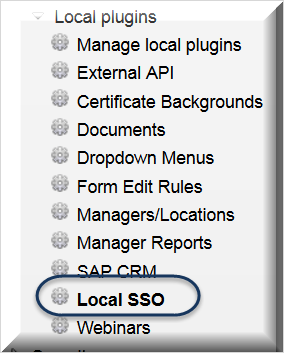 By default, this field is blank, disabling Local SSO. To activate Local SSO, enter your domain name; to enter multiple domains, simply separate them with a comma (,). The Check Key field is a security feature. Enter an alphanumeric phrase in the field that can be used to verify log ins from the company’s other domains and prevent external log ins. By default, Refined Training’s SSO causes the LMS to pull the username and password from the intranet domain for verification. where the value of key is the phrase entered in the Check Key field, here 112233.